Eldest daughter Katharina (Karen Austin) is very beautiful but so sharp-tongued that no man shows any interest; until she marries, however, younger sister Bianca (Kathryn Johnson) cannot hope to walk down the aisle. 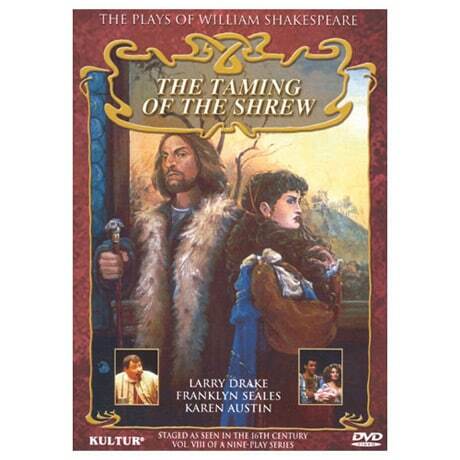 When swaggering young adventurer Petruchio (Franklyn Seales) appears seeking a wife and is smitten with Katharina, their courtship unfolds as a battle of wits, wills, and words, in this 1983 production. This disc is part of a series of Shakespeare's plays that have been specially staged as they might have appeared in the 16th century. Relying predominantly on American actors, the productions are easily understood by newcomers to the Bard's works, while maintaining the high standard expected by aficionados.